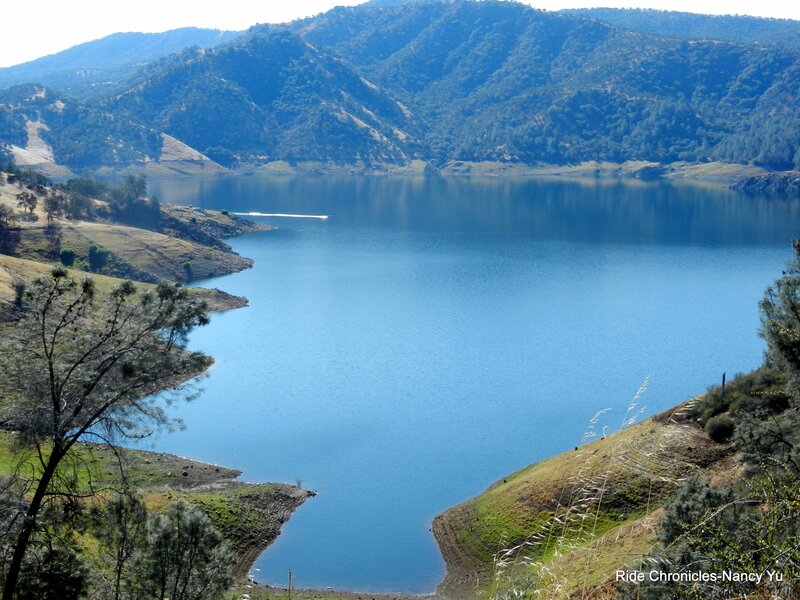 This year’s 7th Annual Bass Lake Powerhouse DC is organized and presented by the Fresno Cycling Club (FCC). 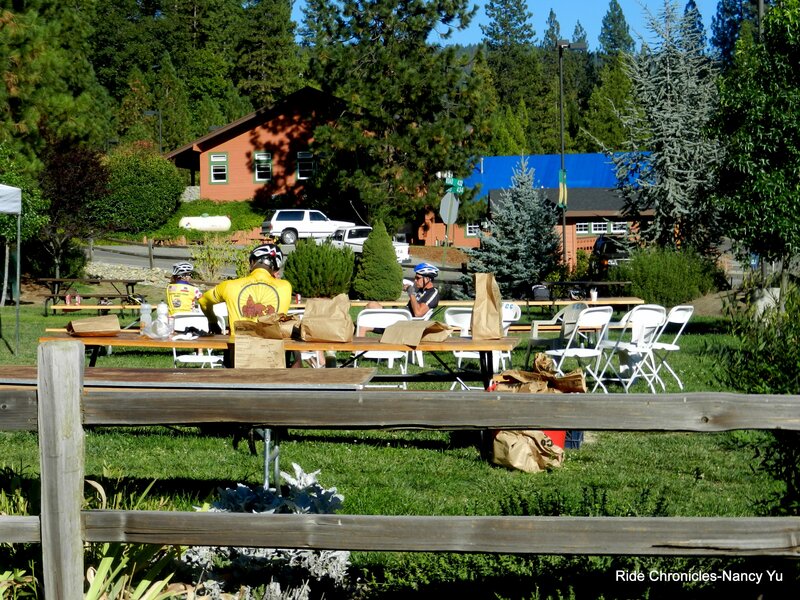 The course is 200 miles with over 10,000 feet of elevation gain. 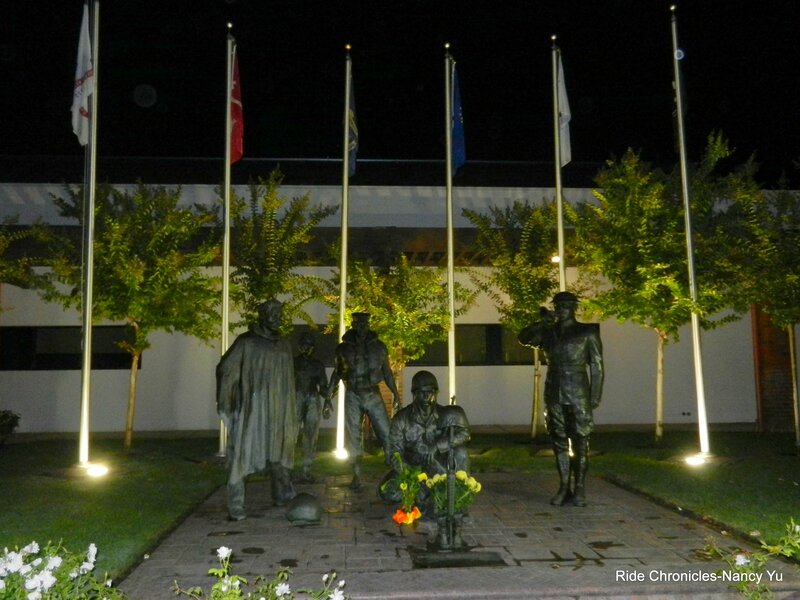 The events’ start/finish is at the Veterans Hall in the city of Clovis; NE of Fresno. There are 125 registered riders. 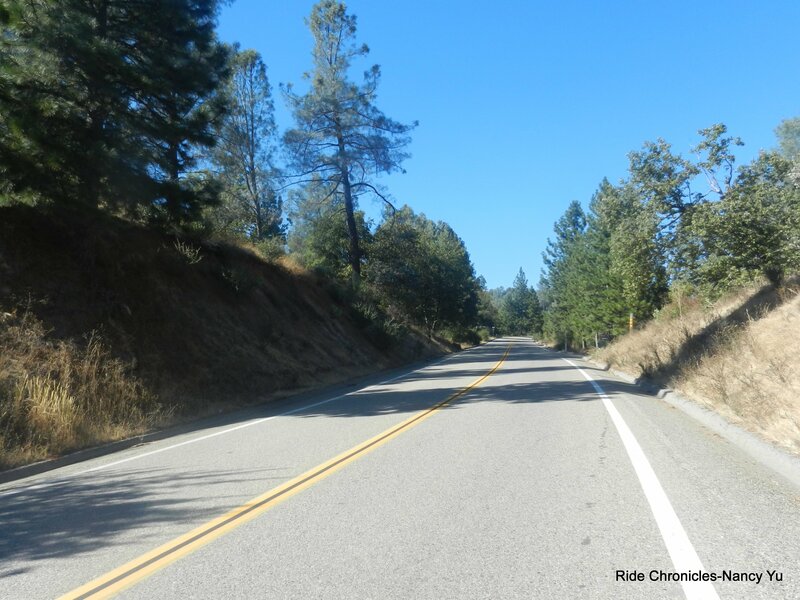 The route takes you from Fresno County and up north to Madera County and back. 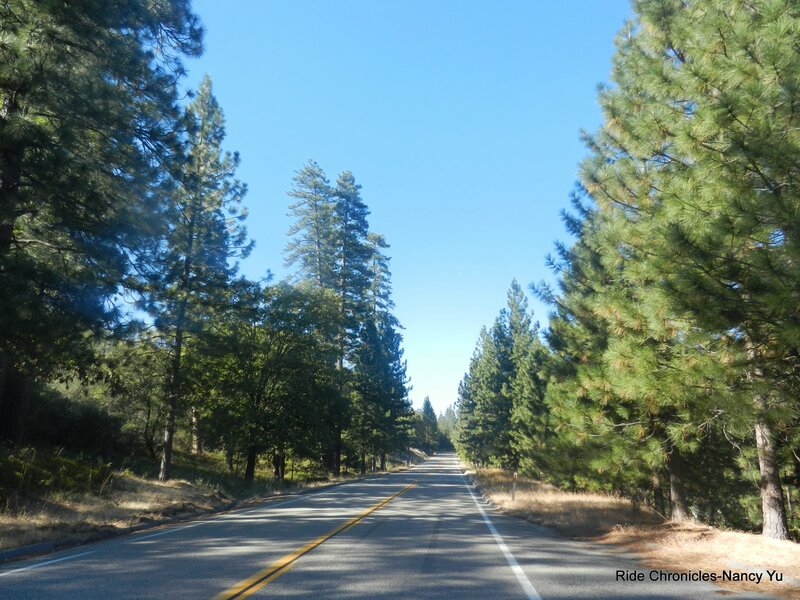 The course passes through many little towns southeast and north of Clovis; Sanger, Celia, Minkler, Piedra, Avacado, Navelencia, Trimmer, Toll House, Auberry, Northfork, Wishon, The Pines and Bass Lake. 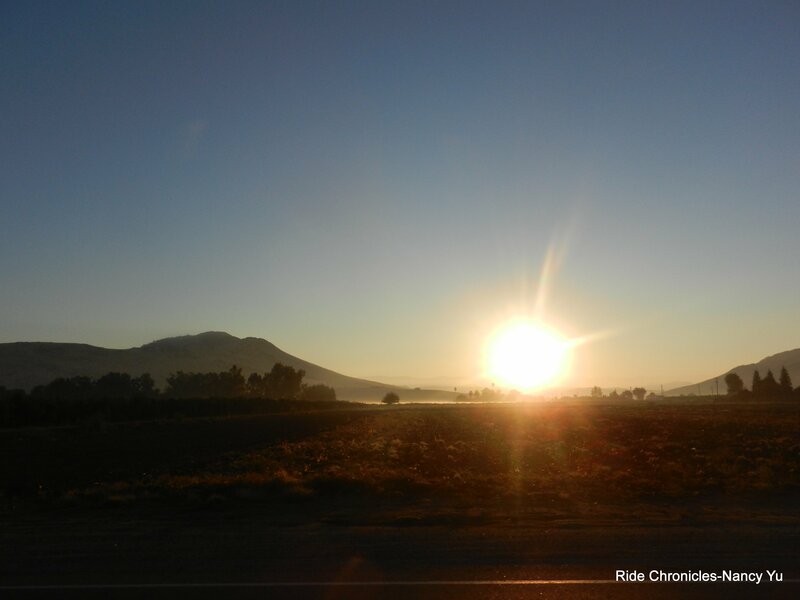 All participants are given a very generous time limit of 21 hours to complete the ride. There are “bailout options” and the course closes at 12:00 AM. Since this is not a timed event, you are allowed to start anywhere between 3:05 AM-5:30 AM. 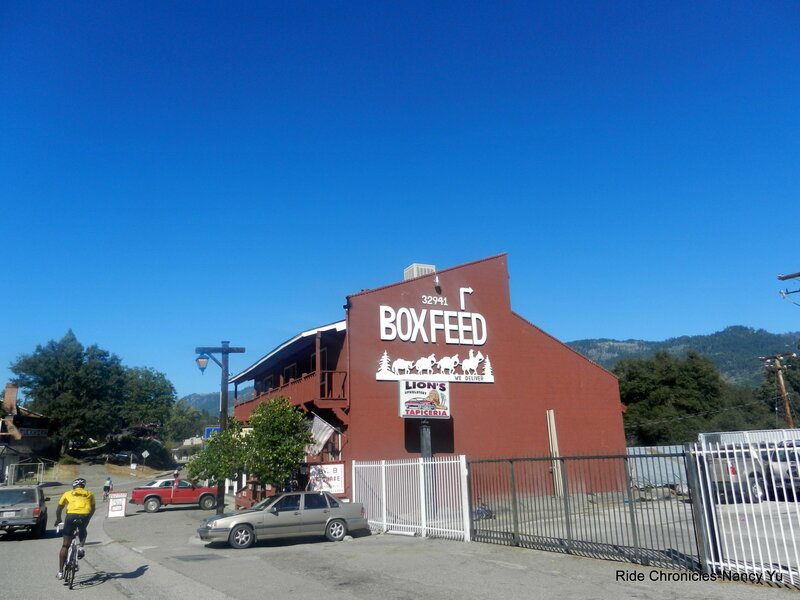 All you have to do is check in and ride off! 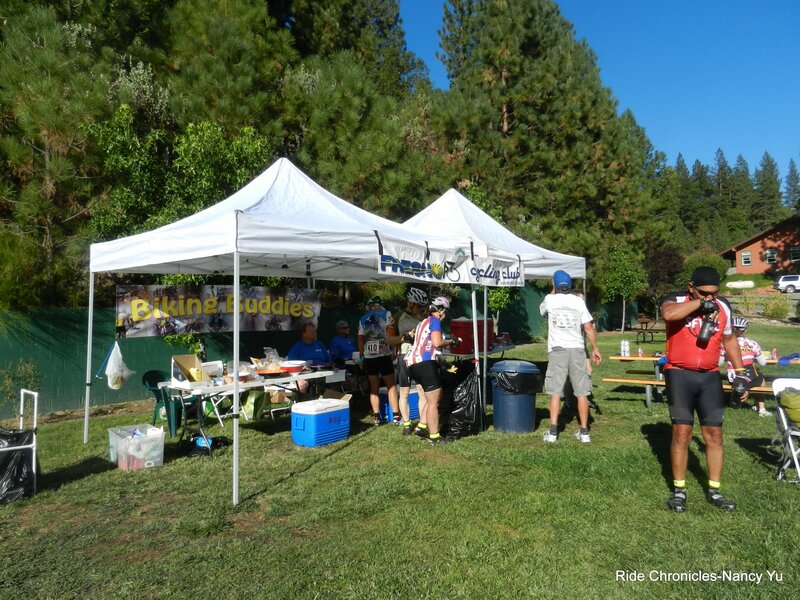 We are provided with 6 rest stops and 1 water stop. Michael and I arrive at the Veterans Hall at around 3:50’ish and can see that many riders are already out on the roads for the earlier start. GREAT! We get all our gear together, check in and ride off at 4:15 AM. We head down 5th St and Michael calls out for a stop-the GoPro camera is not working. He examines it; pushes buttons, etc and it’s not functioning, so we decide to go back to the van and put it away. No sense in carrying it all day if it’s not working! While back in the parking lot, we see the Marks; A & H. We exchange greetings and head out once again. It’s now 4:25 AM with a morning temp of 58F. We’re back on 5th St and continue out of town on Bullard Ave for the next 4.5 miles. I noticed that the street signs here have a silhouette of a cowboy on a bucking bronco; now that’s city pride! 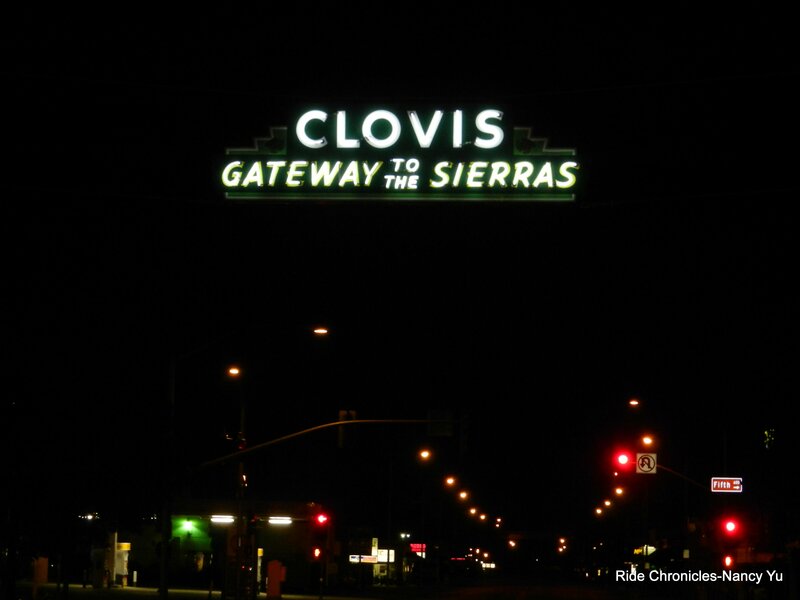 Clovis also claims to be the “Gateway to the Sierras” with its brightly lit neon sign in the center of Old Town. 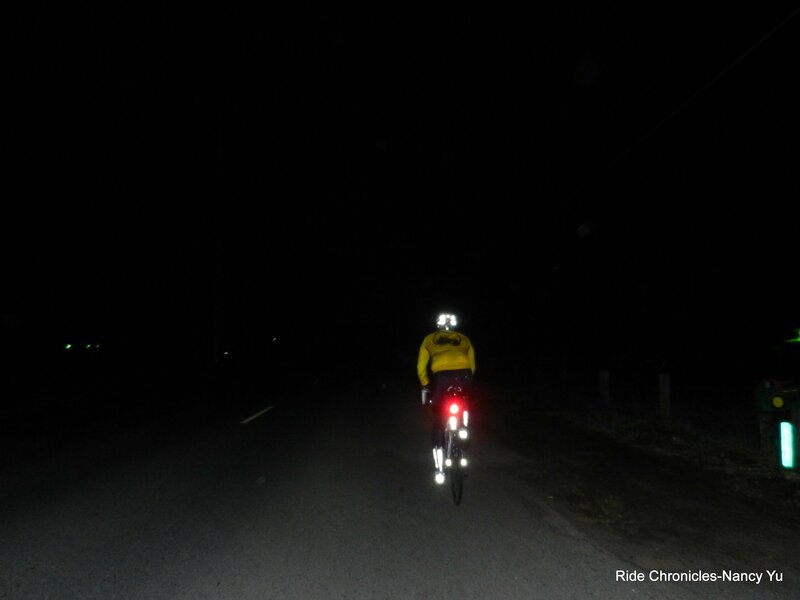 We turn on McCall Ave and ride into the night for the next 9 miles. 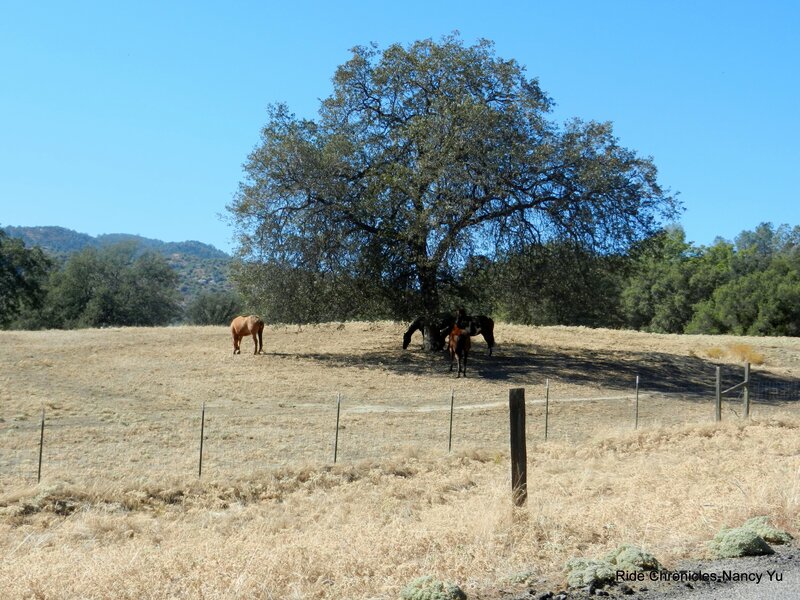 We pass many fruit orchards, horse ranches, grape fields and vast open fields. I can smell the rich earthiness of the surrounding farmlands. My helmet light shines on a sign that reads “avacadoes for sale”; I can immediately smell the aroma of the fruit in the air! There are also signs reading “pickers wanted”. Who says there are no jobs! 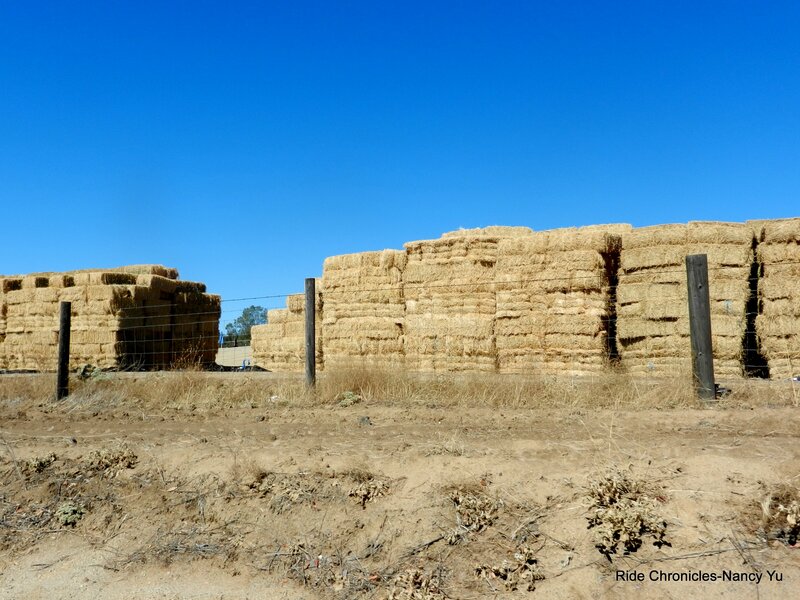 The Central Valley is the heartland of agriculture in this wonderful State of ours; they can grow almost anything here; how fantastic! I always try to buy local fruits and produce to support the hard working farmers who have the tremendous job of growing food to feed this nation. THANK YOU! Continuing on McCall, as we get closer to the intersection with Hwy 180, I can see bright lights appearing from the distance; it’s a decent sized PG&E substation. It certainly lights up the whole area and makes crossing the highway much easier! The lights then slowly fade away behind us as we continue into the early morning darkness. I look up into the sky in search of the moon and instead find myself smiling at the bright little stars above me! 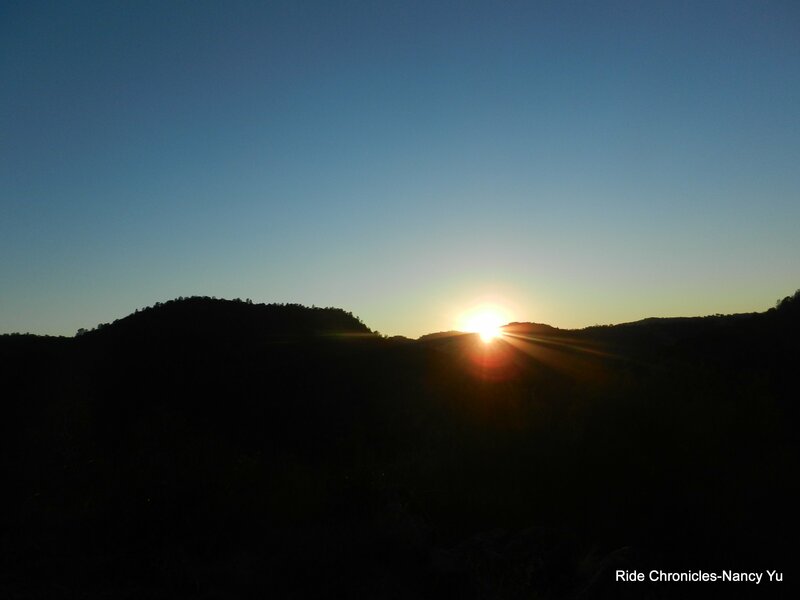 It’s for moments like this that I actually enjoy riding in the dark; everything else is stripped away and the natural beauty that surrounds us appears. I’m counting my blessings! The next turn on North Ave takes us on rough pavement along the edge of a residential tract neighborhood and into the industrial area of Sanger. We take another turn on Newmark Ave to Annadale Ave. The front lights of the ranch homes here provide us with a warm glow along this road. We also wake up all the dogs in the area as we ride by; they’re all barking at us in unison! I also noticed that truck traffic was a bit heavier as we got closer to the many farms in the area. Owning and working the fields is a 7 day work week. 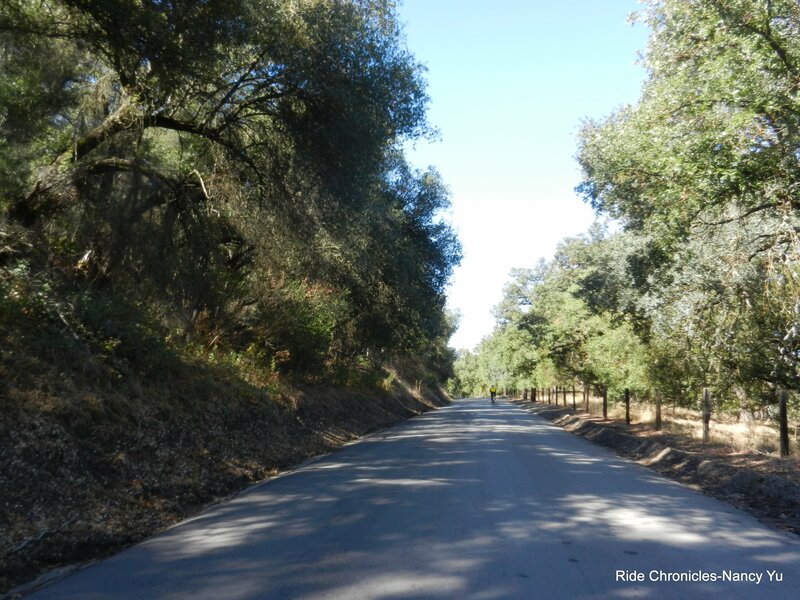 The next turn on Reed Ave takes us through more orchards as we roll in and out of the town of Minkler. 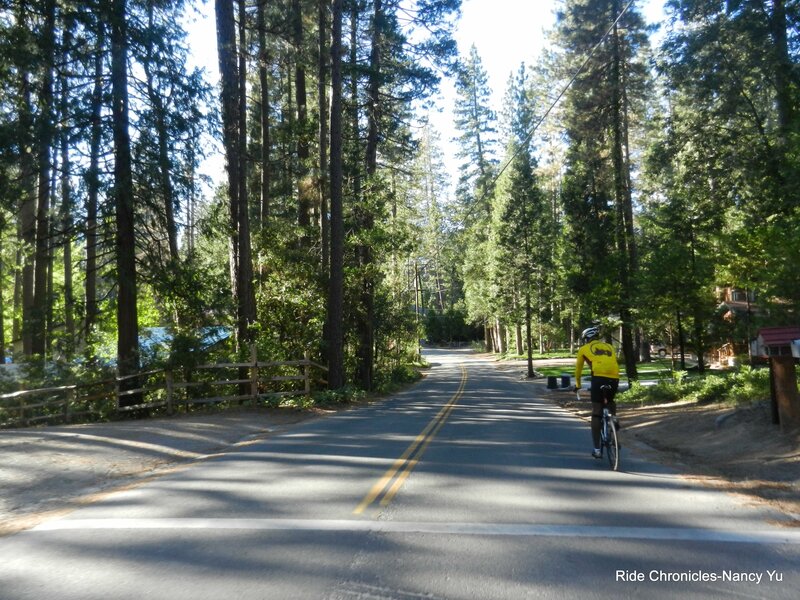 We cross a bridge and make a right onto Rio Vista Ave which eventually merges onto Trimmer Springs Rd. I can immediately feel the temp drop and look down at the odometer; it’s now 47F. 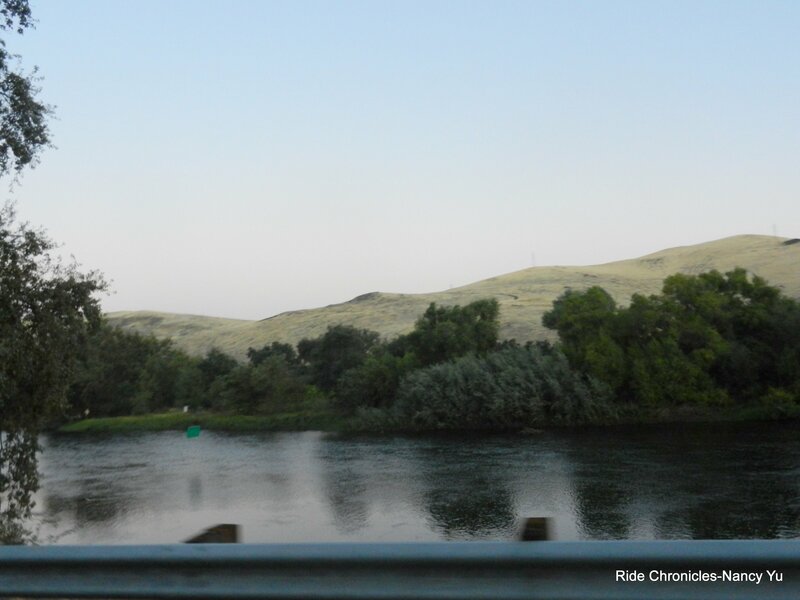 We’re now riding along Kings River; I can hear the rush of the water flowing besides us. The only traffic at this time of day is the trucks towing their boats up to the lake. There’s even a small airport in this area. 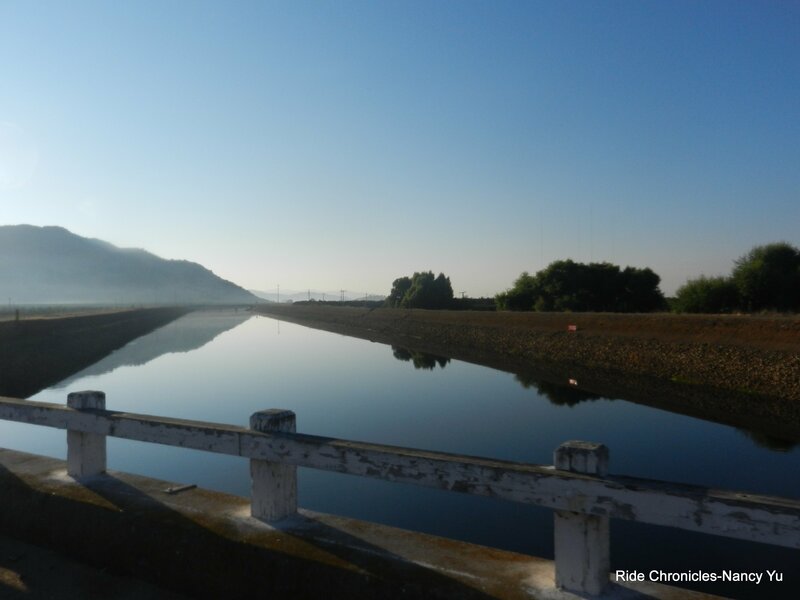 It’s a fabulous 7.2 miles stretch along the river; the early morning air is fresh and daybreak is upon us! The terrain from the start of the ride to this point has been totally flat. 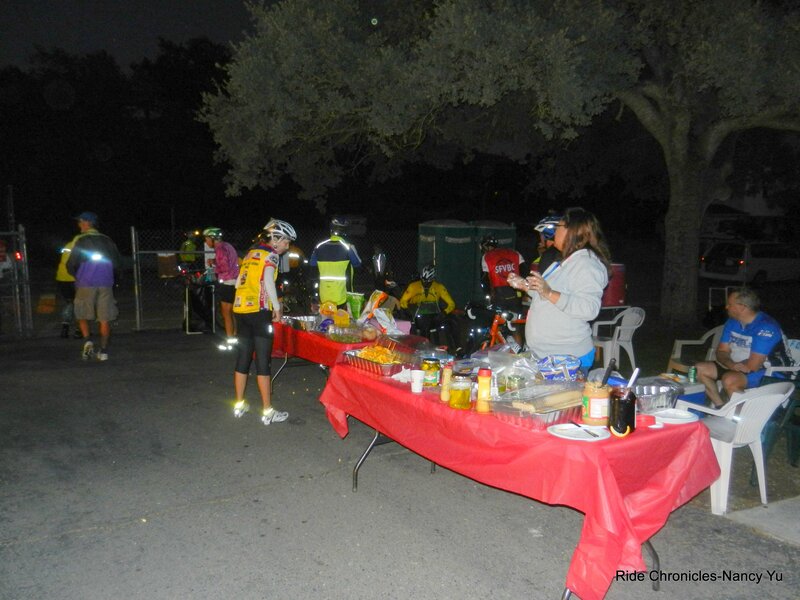 We cross the bridge on Piedra Rd and arrive at Rest stop#1-Winton Park, mile 34.7 at 6:25 AM. 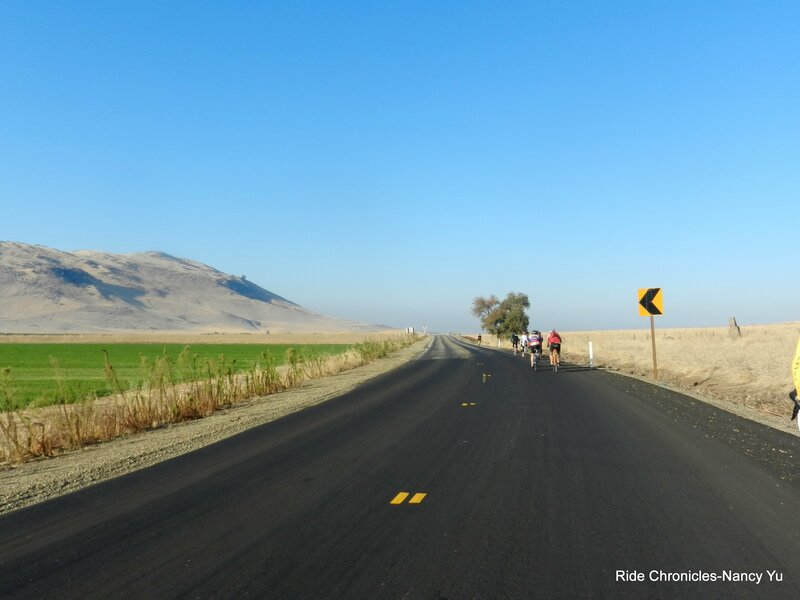 We continue on Piedra Rd and head south; the route will take us back to Minkler for another flat jaunt around the farmlands of Celia and Navelencia and then back north again to Winton Park. It’s a mini figure 8 loop. 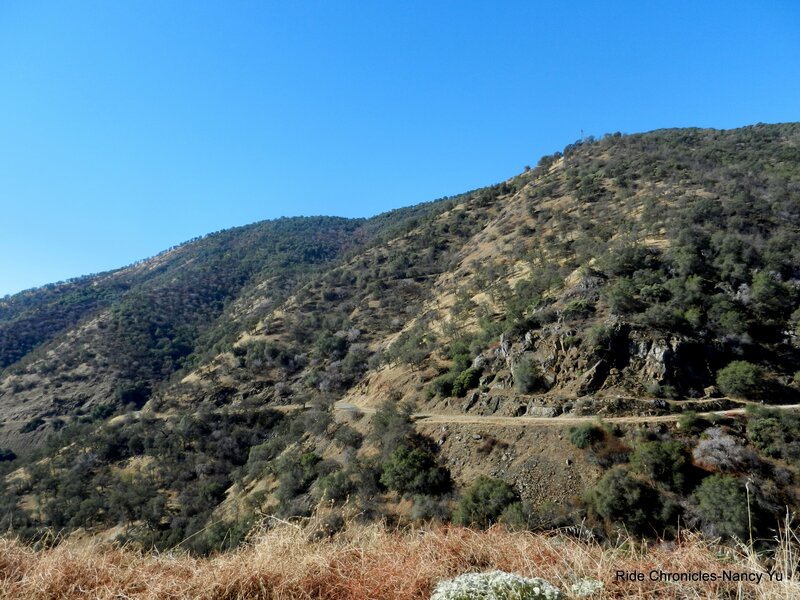 We stay on Piedra Rd for 8.2 miles to the turn onto Kings Canyon Rd/Hwy 180. 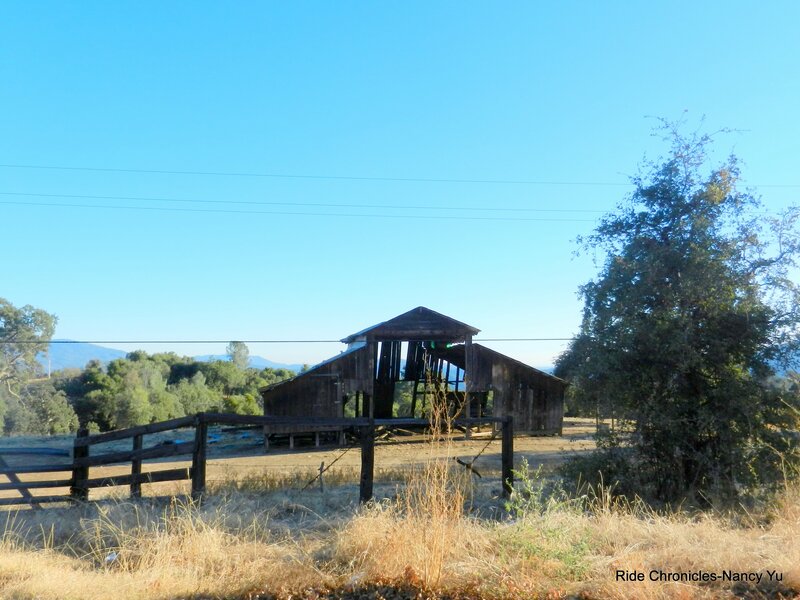 There are a few old farmhouses and ranches on Piedra along with more citrus orchards. It’s still a bit cool back here; we’re riding along the other side of the river now. 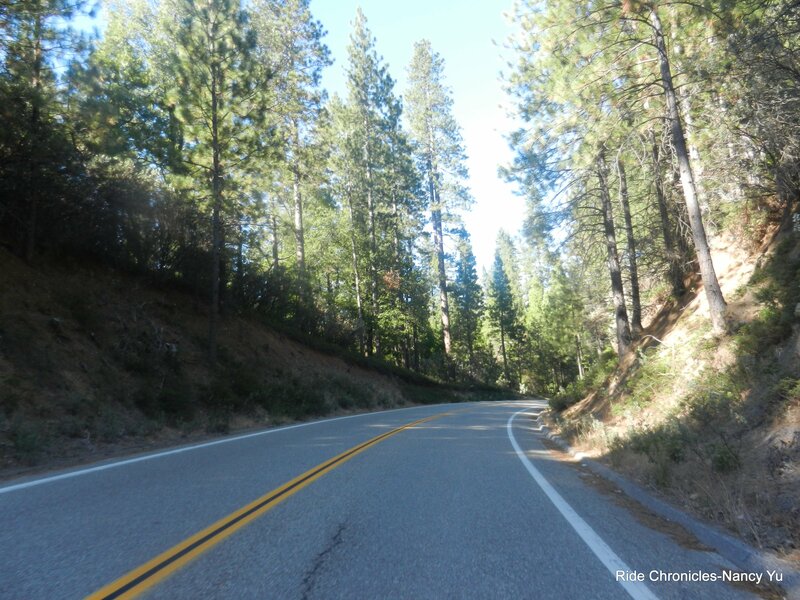 The short stretch on Kings Canyon Rd is positively gorgeous! 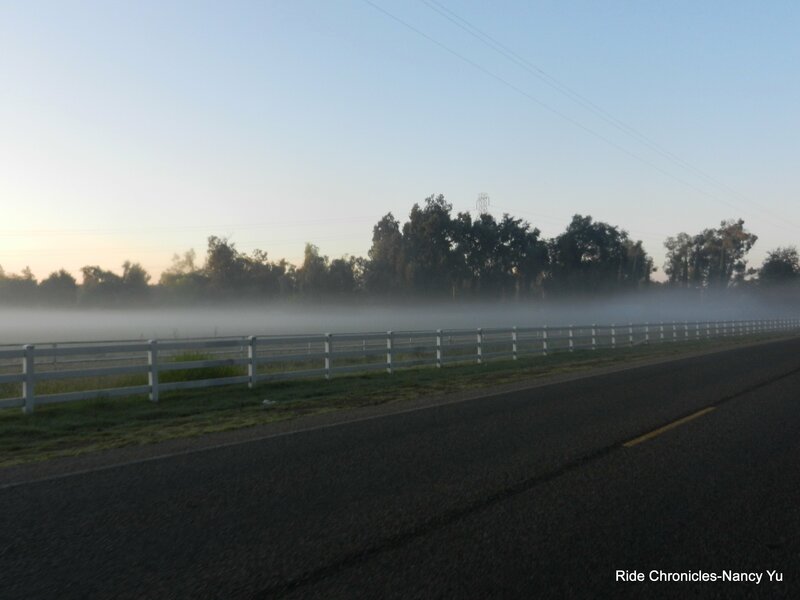 The first thing I notice is the low lying layer of fog that just hovers oh so gently amongst the grazing horses and open pastures. This visual creates a feeling of stillness, peace and calm for me. The sun is rising and sets the tone of the day to come; it’s going to be a good one-I feel happy! It’s quite the sight to see and it’s another one of those moments for me! 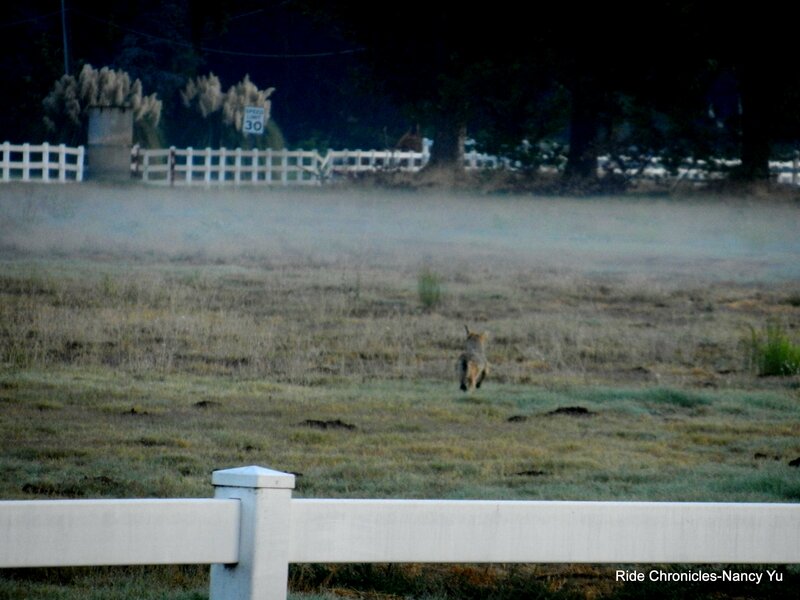 Michael calls out for me to look at the coyote that’s trying to catch something in the field, I turn around just in time to catch a back shot of it running off. This is horse country back here; there are horse ranches after horse ranches along with a natural dirt/sand race track. 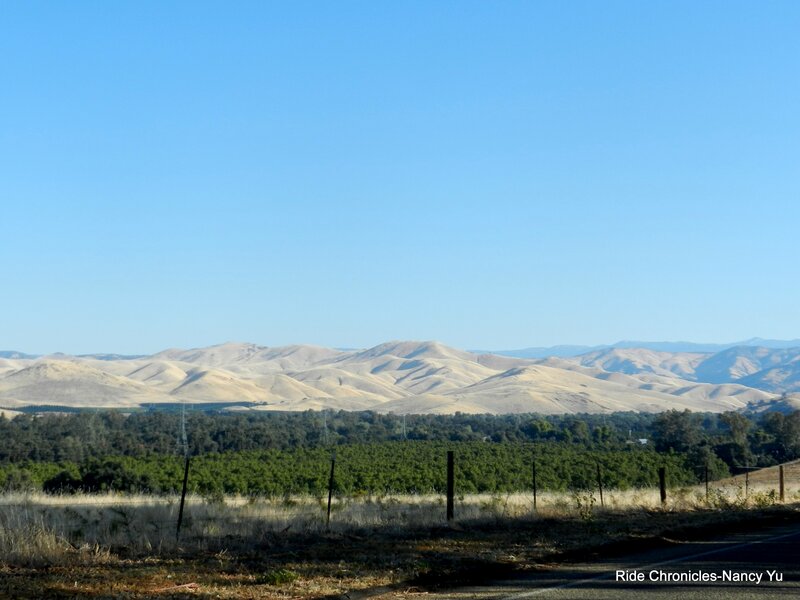 We continue along more orchards and head down Reed Ave to Central Ave. We ride through the plentiful and bountiful fields of grapes, peach, nectarine and plum orchards. 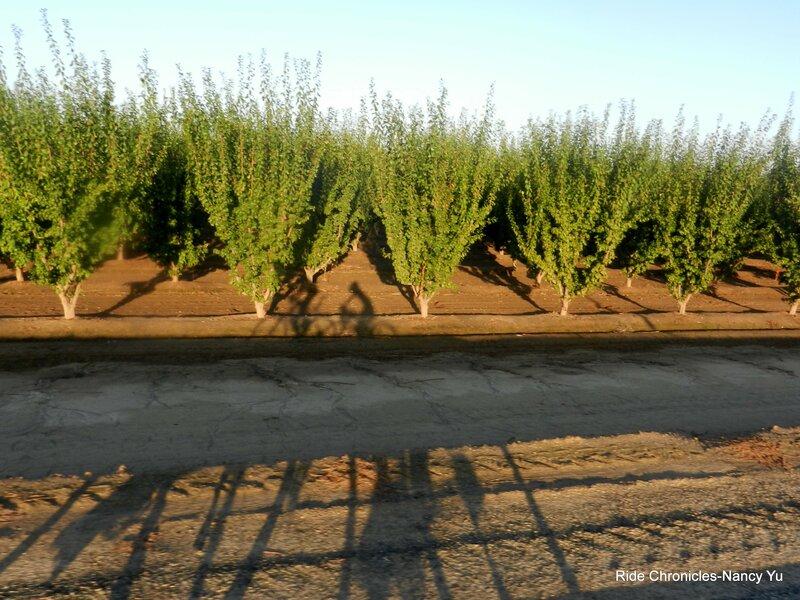 There are also rows and rows of new growth fruit trees and what I think are pistachio trees. The Friant-Kern Canal runs through the Central Valley and helps irrigate the surrounding farmland and open fields in Fresno County. 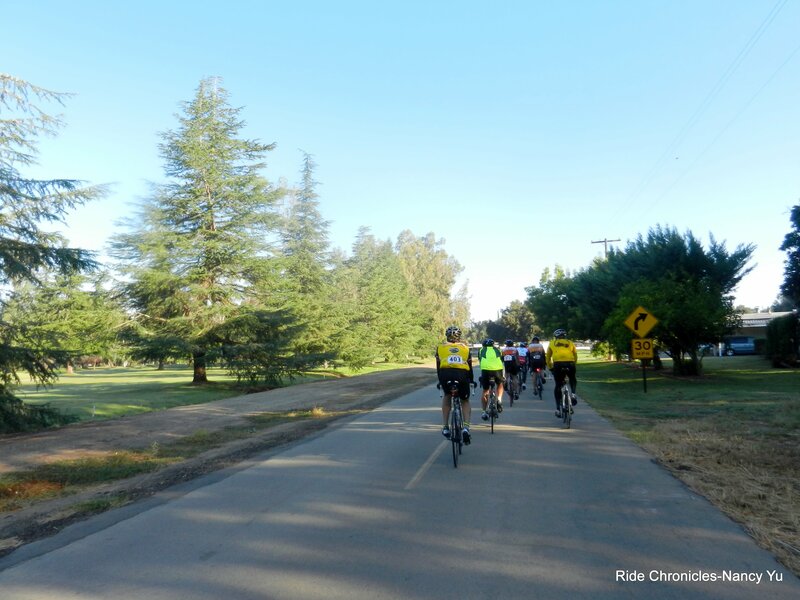 We take a series of turns in, out and around the eastern section of Navelencia and end up heading back west on Hwy 180 to Frankwood Ave. We’re close to completing this flat figure 8 loop; the final stretch on Piedra Rd will take us back to Winton Park. 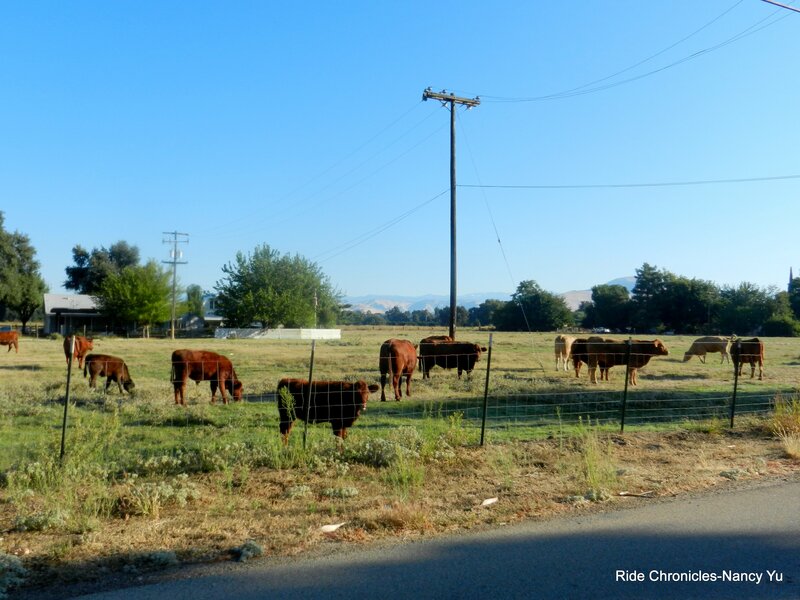 We ride pass a golf course, a mobile home neighborhood and open meadows and pastures for grazing cows and horses. 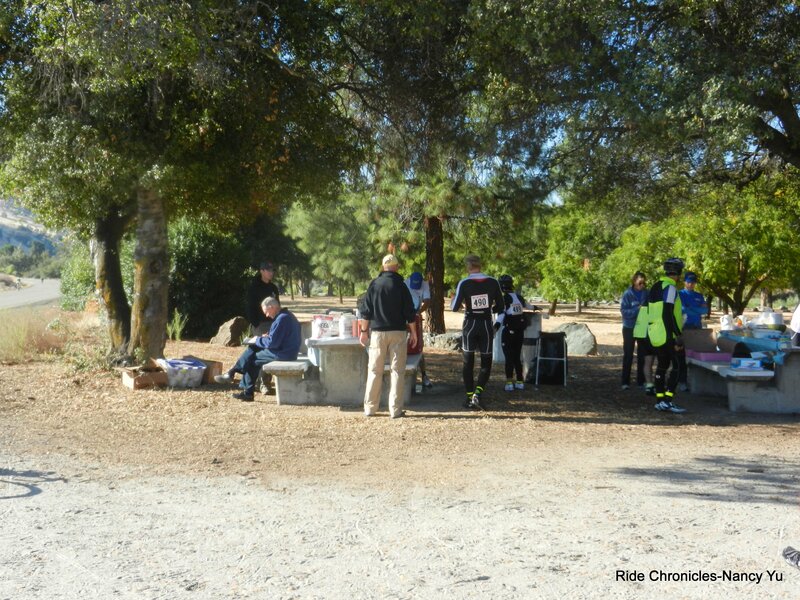 We arrive back at Winton Park-Rest stop#2, mile 72.3 at 9:12 AM. The elevation gain for this morning loop is at around 500 feet; that’s pretty darn flat! We only have another 130 miles to go. 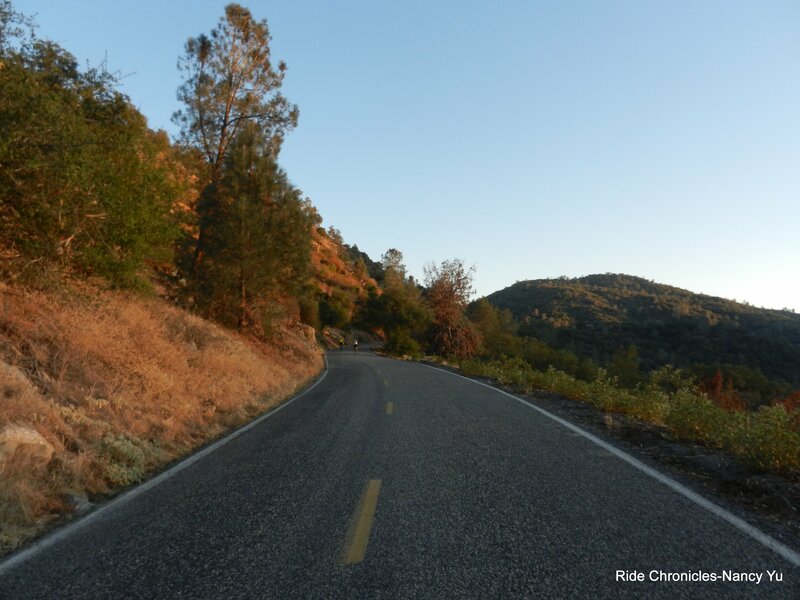 We continue on Piedra Rd and head NE on Trimmer Springs Rd for the next 13.5 miles to Pine Flat Lake. The climbing starts off gently at around 2-3% and increases to gradients of 5-8% for the remainder of the way. You’re at the top when you see the sign for Critter Hill Ranch. I saw a great advertisement sign at the intersection of Sunnyslope Rd for “The I Forgot Store”, it must be aptly named for folks who need to stop by to purchase items they forgot to bring. The traffic is pretty minimal except for the occasional truck with a boat in tow. The road conditions are great back here. 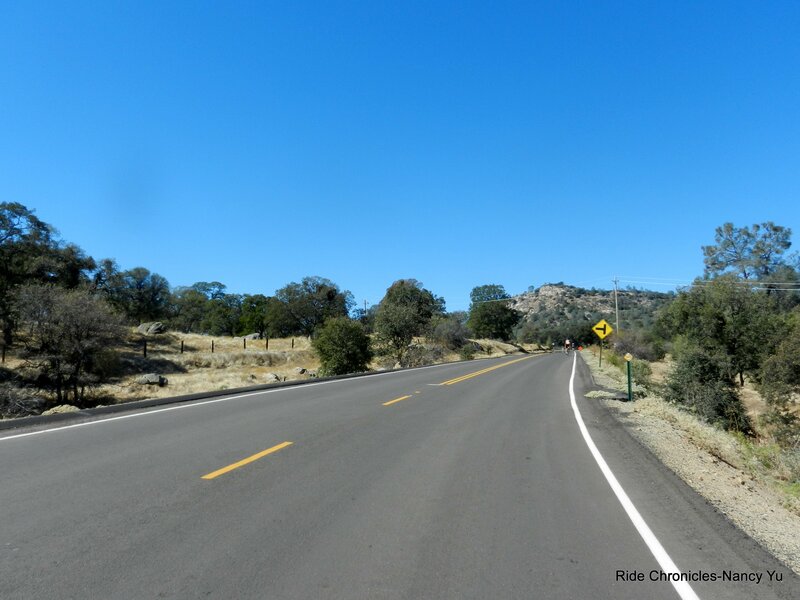 After the slight downhill, the road levels out a bit and as you make the right hand turn out of the area, the road opens up to wonderful unobstructed views of Pine Flat Lake. It’s definitely an eye-opener; the lake is absolutely beautiful! 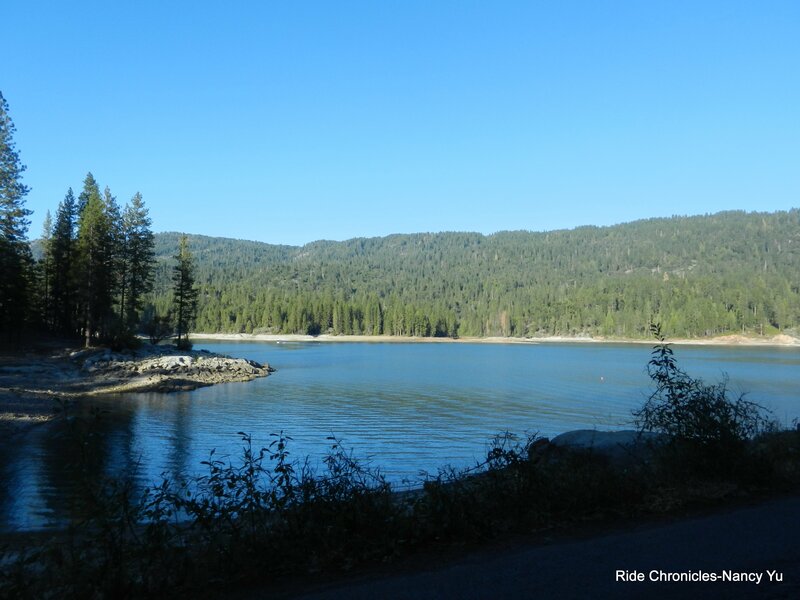 We get to ride around this mountainous area with the lake serving as the backdrop; how fabulous is that? There are also about half a dozen cattle guards to cross along this flat to rolling terrain along the lake. We stop for a moment to remove some layers before the next climb up Maxon Rd. The first section up Maxon is steep but short with gradient ranges of 10-12%, it then drops down to ranges of 7-8% for the remainder of the ~2 mile climb. 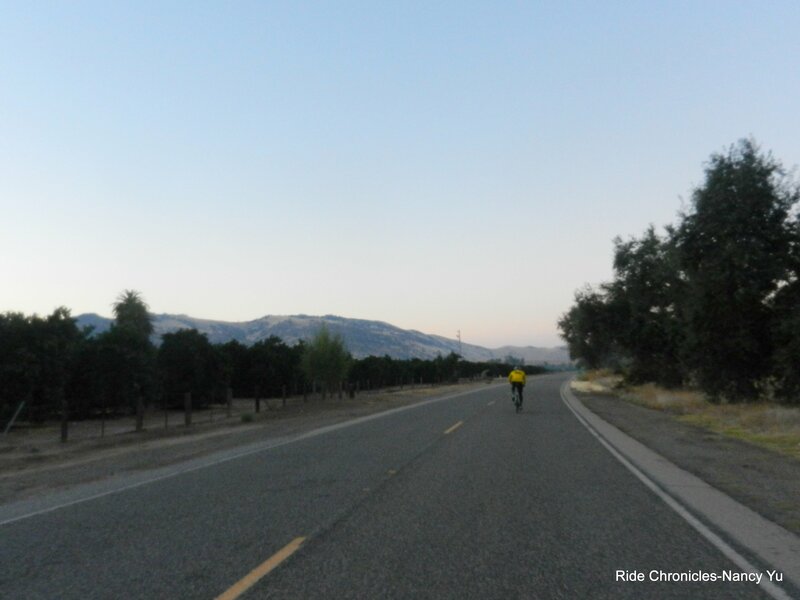 The next few miles on Maxon takes us down into the valley on flat to rolling terrain; for me, it compares to riding around Del Puerto Canyon out near Patterson. It’s a beautiful quiet stretch of road with no traffic! We reach the water stop at Watts Valley Rd, mile 91.0 at 11:10 AM. We top off our bottles, remove additional layers and head on out. 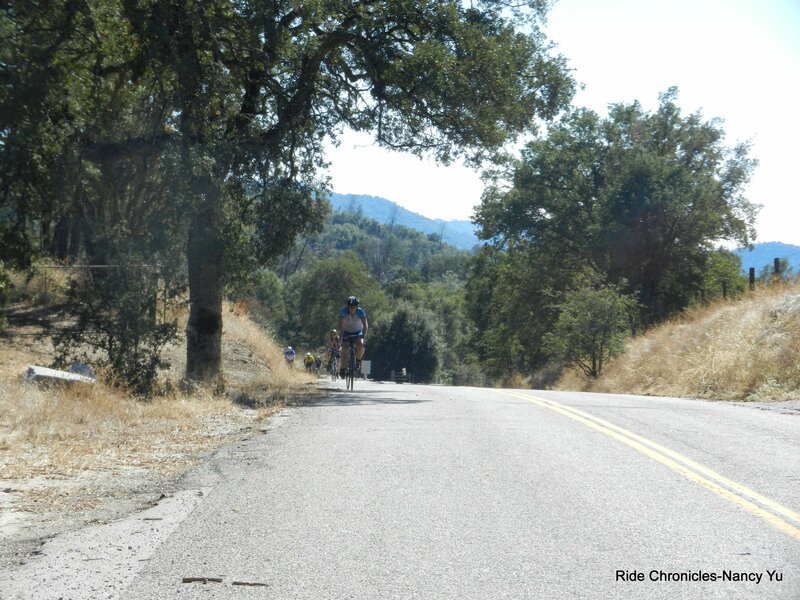 We stay on Watts Valley for the next 3.2 miles; it’s a steady climb with gradient ranges of 5-8%. The road becomes Burrough Valley Rd as we make our way through a small rural farming community. The terrain is somewhat flat all the way to the turn to Tollhouse Rd. The rollers on Tollhouse bring us to Lodge Rd. I noticed that a police car and ambulance passed us a bit earlier and now can see them pulled over on the side of the road. I was hoping that it wasn’t a cyclist but it was; I see someone picking up a blue Pinarello bike off the road. I can feel my stomach tightening up immediately and me letting out a sigh. We continue a short distance on Hwy 168 to SJ & E Rd into the town of Auberry. We arrive at Rest stop#3-Auberry School. mile 107.4 at 12:45 PM. Temp 72F. This is also the lunch stop; I have half a ham & turkey sandwich with pickle chips and some watermelon slices along with a can of Mountain Dew. One of the major climbs of the day is coming up. We continue on Auberry Rd and take a left at the Y intersection up Powerhouse Rd. 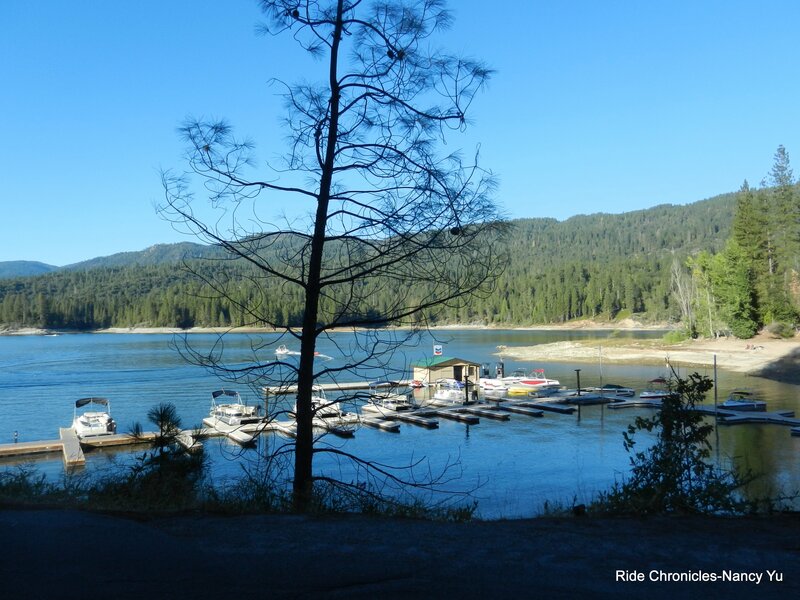 We stay on Powerhouse for the next 7.2 miles; the first mile or so up has gradient ranges of 5-6%, the road then levels out before the long descent towards Kerckhoff Lake. 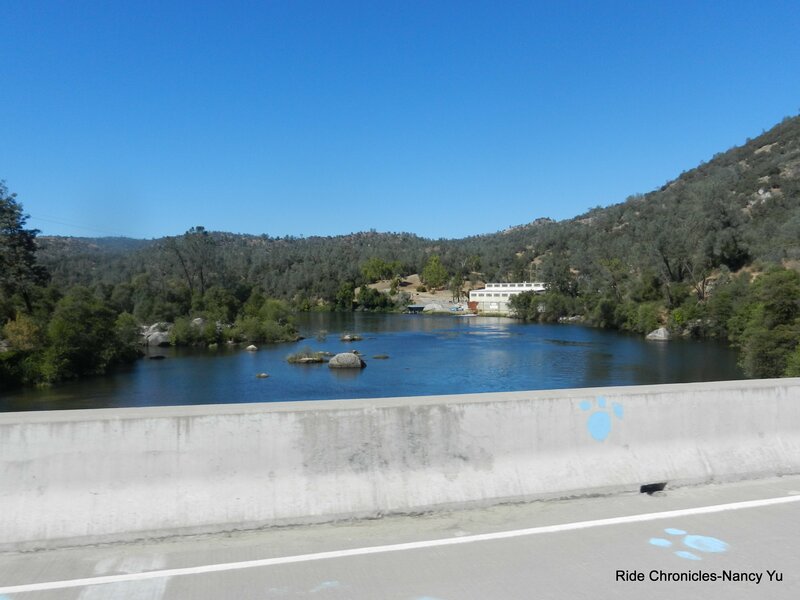 We enter Madera county as we cross the bridge to the PG&E Wishon Powerhouse. We are now on Road 222; it’s about a 6.5 mile climb up towards Northfork. 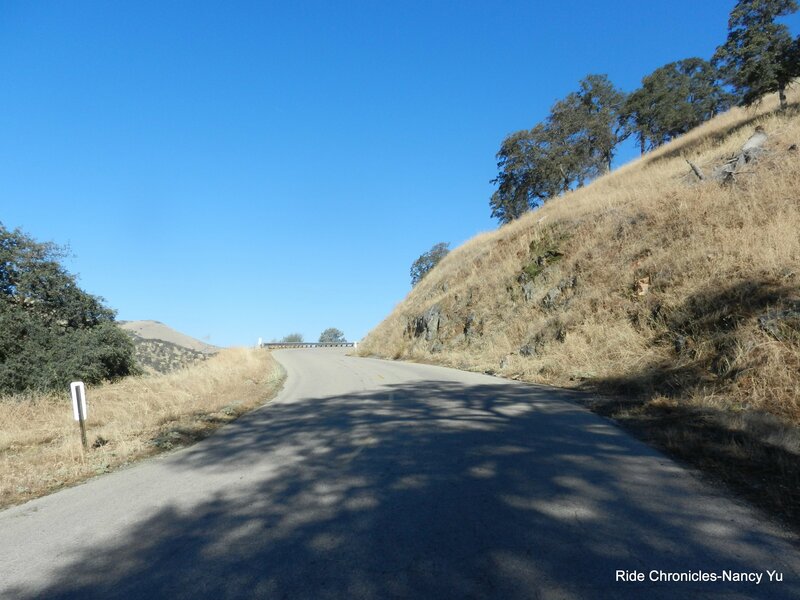 The gradient starts off at around 4% and creeps up to 7-10% as the climb goes on. There are multiple steep sections with gradients of 10-13% and pitches hitting 14%! The grades drop down to a steady 7-9% for the remainder of the climb. There are a few people who have gotten off the bikes and walking up, others are stopping under what little shade they can find along the way. It’s a sunny and bright 83F here with full sun exposure! There is an impromptu water stop at the top; the sag guy is running out of water. i share what I have with Michael and we continue on. The road eases up a bit to around 3-4% followed by a brief downhill and another short climb of about 9-11%. The last half mile levels out before we reach the next turn onto Road 225 into Northfork. We continue heading north on Road 274 for the next 8.6 miles. The initial gradient at the start of the climb ranges from 7-9% and then eases up to around 4-6% for most of the way. There must not be a lot to do around here; I see a teenage boy on the left side of the road holding a stick and playing around with a snake that’s trying to writher away. Near the top of the ridge, there is a sign that reads Sierra National Forest. The scenery is top notch and the road conditions here are fantastic. I’m in total awe of this area and can’t believe that I’m out here on my bike! Life is certainly great! Michael is ahead of me as we near the next turn onto Road 434. All of a sudden I hear a loud crash behind me, I turn my head back and see that a car has hit a deer. The deer slid across the road onto the embankment. I count my blessings; I just passed that section less than 30 seconds ago! We arrive at Rest stop#4-Pines Resort, mile 131.0 at 3:54 PM. We sit for a bit and I have my favorite standard on DC’s-a chicken cup o’ noodle. We exit the rest area and continue on Road 432 and head south on Road 222 for the next 7.6 miles around Bass Lake. The surrounding scenery and the views of the lake are spectacular! 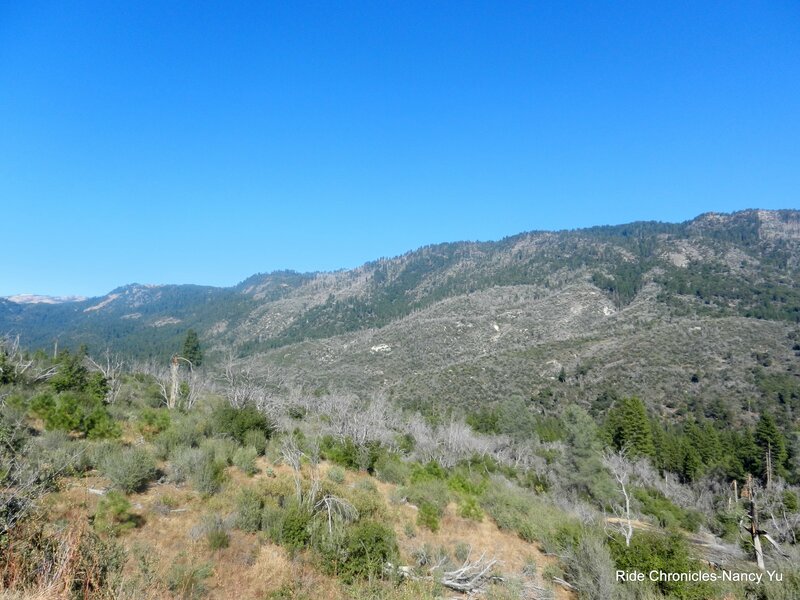 This is still part of the Sierra National Forest; California is a beautiful state and it has a lot to offer in terms of natural beauty. 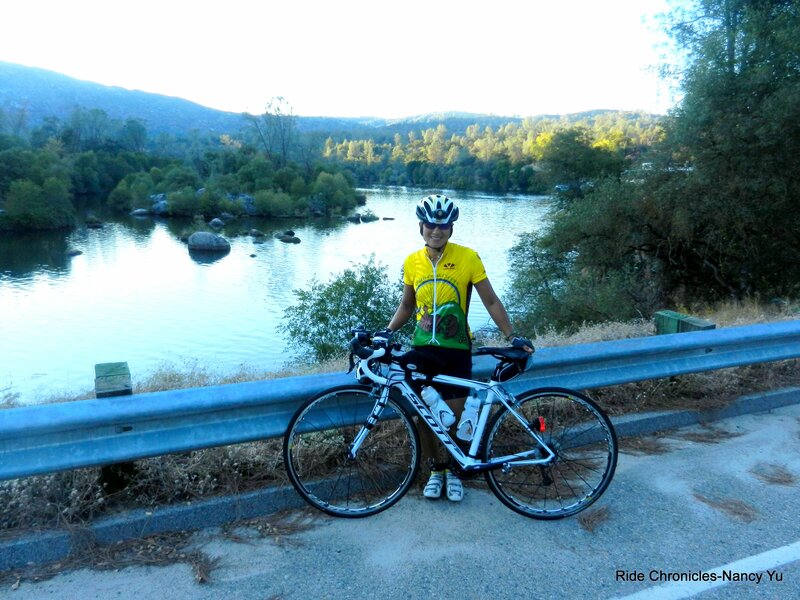 I’m going to take a mental note and make a conscious effort to ride throughout California! There is so much to see, we just have to get out and do it! The turn onto Road 221 takes us pass Wishon and I was quite taken aback to see a quarry with construction work here. The 4 miles on Road 221 leads us to Road 200 heading east. We pass some old barns and homes that are hidden from the main road. I see a father and his sons out on their property revving up the ATV’s on the dirt roads. We are retracing the route back to Auberry from here. 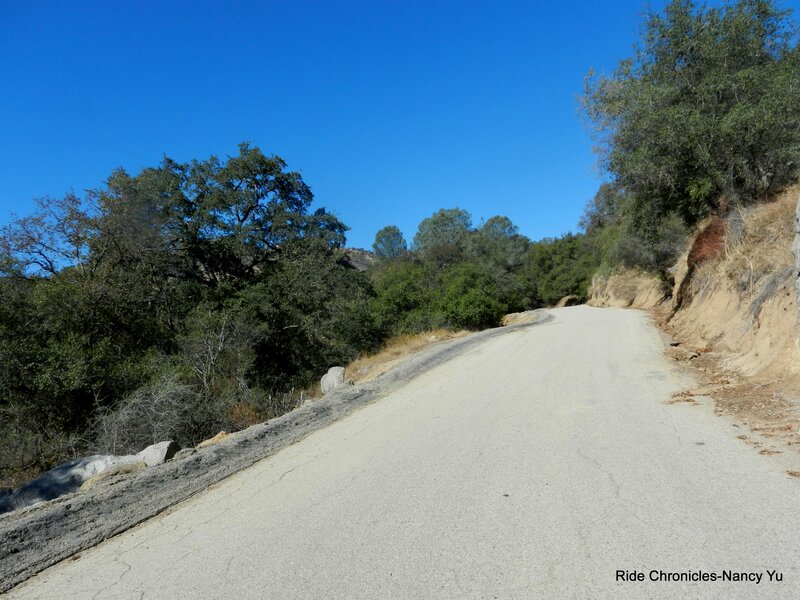 The previous climb on Road 222 is now a crazy fast long descent; this is the only section of road on this route that is in very poor condition. Watch out for all the potholes, FCC marked most of the large ones with red spray paint. I’m thankful we’re not descending this in the dark! We’re back at the Powerhouse and Lake Kerckhoff. The events’ namesake climb is coming up! 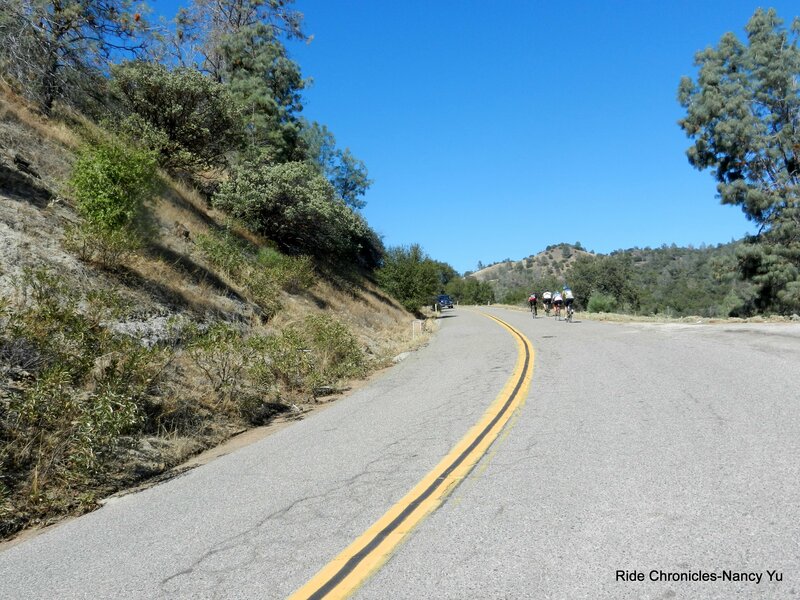 It’s about a 4+ mile climb with starting gradients ranging from 6-9%. There are a few sections that hit 11-12%; it then eases up to around 4-7% for the remainder of the climb. The next few miles are flat followed by a fast descent back to Auberry. The sun is quickly setting and cast an amber glow against the mountains beside us. We arrive at Rest stop#5-Auberry School, mile 161.6 at 6:53 PM. Temp 55F. We have less than 40 miles to go! For the remainder of the route, we’re supposed to be on flat to rolling terrain with no major climbs ahead. Yeah! We put all our layers back on, plug in our front lights and head out. I have my light set on high and it doesn’t look as bright as before. It’s plugged into a fresh battery and I’m a bit puzzled by it but we continue on down the road on SJ & E Rd. It finally hits me that I still have my dark lenses on! Silly me, I forgot to change them out at the rest stop. What a difference clear lenses make, I can see the road ahead of me! A quick left on Hwy 168 takes us on Lodge Rd for the next 5 miles. We continue on Tollhouse Rd for the next 7.4 slightly downhill miles and come up on our turn at Nicholas Rd. It’s very easy to miss if you’re rolling by very fast and not paying attention to the road marking. FCC has the brilliant idea to attach a small blinking red LED light on the stop sign at the turn. How wonderful that is! Who threw in this last climb here? Nicholas Rd will take you by surprise in the dark; it’s a steep but thankfully short 10-11% climb. It’s like going up Shasta Rd in Berkeley. After cresting the hill, my lights shine upon some little frogs jumping across the road. We continue on Millerton Rd/Hwy 168 for less than a mile and have to cautiously cross the highway to stay on Millerton Rd. There is quite a bit of traffic here. 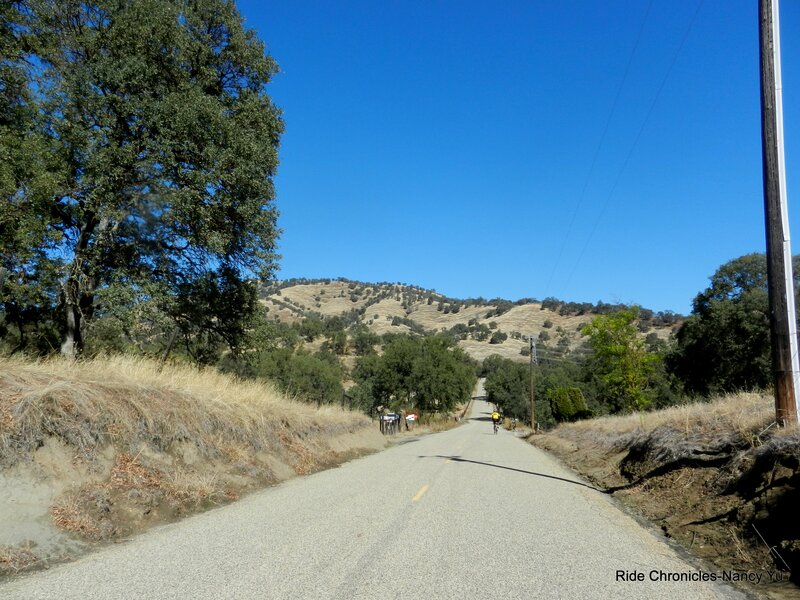 Millerton is a narrow single lane road with fantastic pavement. The next 5.1 miles is on flat to rolling terrain. We encountered one car that honked at us. The next 0.8 mile on Auberry Rd brings us to the last stop of the day. 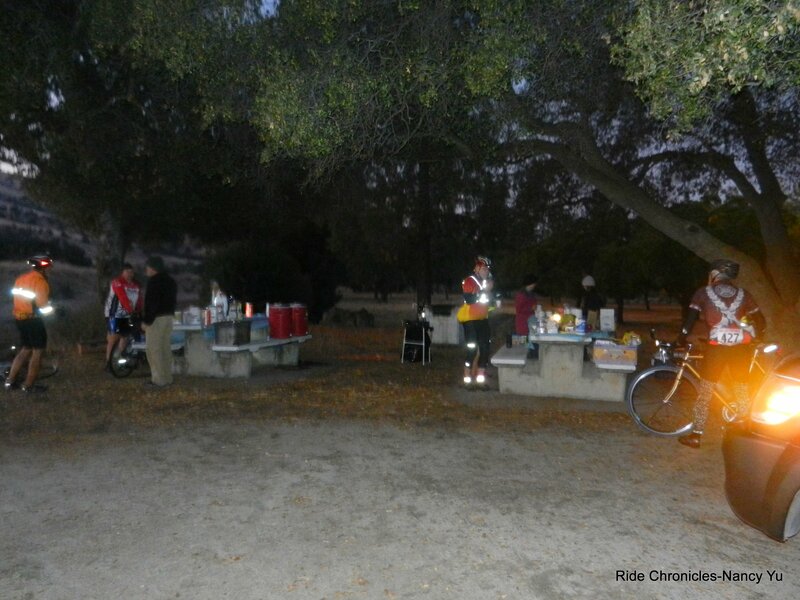 We arrive at Rest stop#6-Millerton Store, mile 184.6 at 8:45 PM. 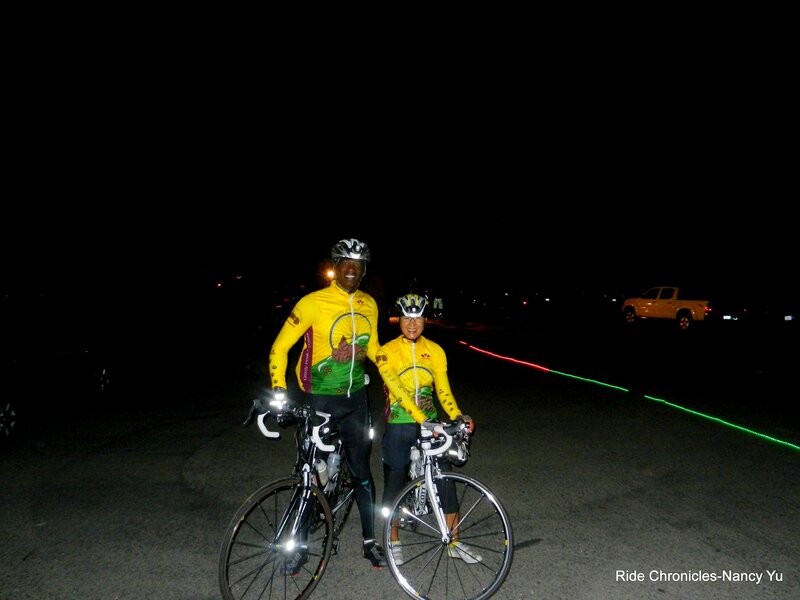 There are colored glow sticks on the ground to create a “runway” so to speak for all the riders to come through! We originally planned to just check in and leave but the overwhelming enthusiasm and friendliness of the volunteers was contagious. Someone took my bike and parked it for me. 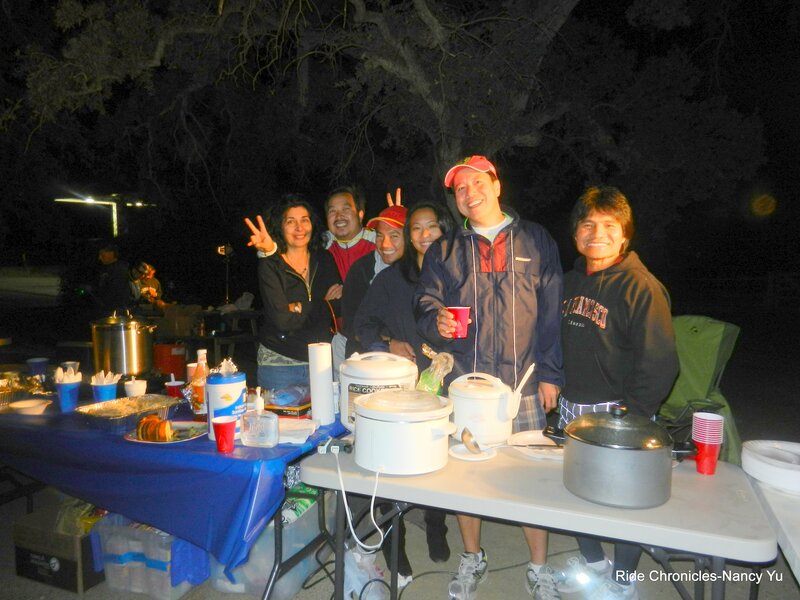 What sealed the deal to stay for a bit were the offerings of homemade soups by this “Filipino contingency” of volunteers. They cheered at everything! I couldn’t pass up the chicken congee and wonton soup-I’m Asian! I would never get this type of food at any other double century! I give this rest stop a 5 star rating, it’s the best ever! The volunteers cheered us off and we’re back on the road again. I left that rest stop with a big great smile on my face! That’s what it’s all about- volunteering to ensure that all the participants is taken care of. JOB WELL DONE TO ALL THE VOLUNTEERS ON THIS RIDE! We continue on Auberry for the next 8.7 miles on a slight downhill with a couple of small short climbs. Auberry drops us to the edge of Clovis on Copper and Minnewawa Ave. We continue on Villa to Sierra and Clovis onto 3rd and Hughes. We arrive at the Veterans Hall at 9:53 PM. Temp 60F. Michael checks in for both of us and we are done! YEAH!! We run into the Marks again at the end of our ride. Michael and I put the bikes away, change up and head inside the Veterans Hall for the post ride meal. 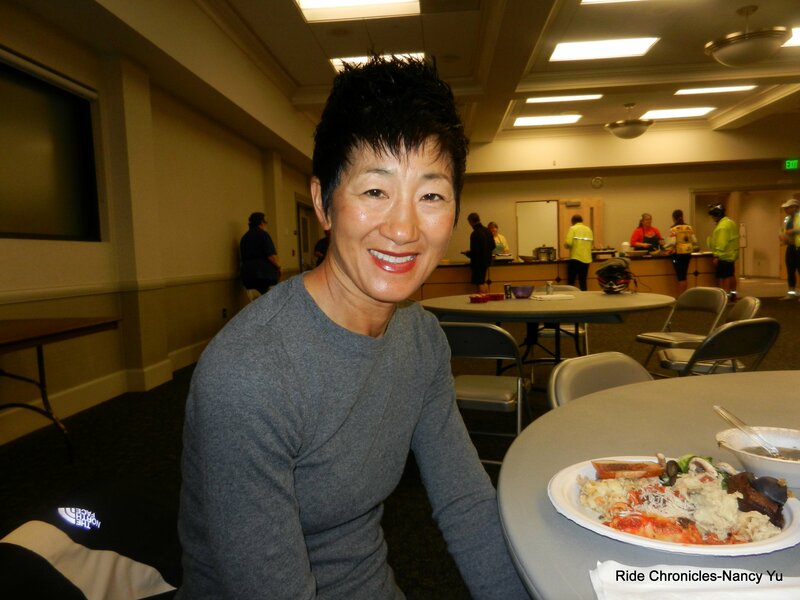 It’s always great to have a sit down meal after a long ride. I had a bit of everything; vegetarian and meat lasagna, chicken casserole, chicken meat, salad, toasted garlic bread and spinach soup. 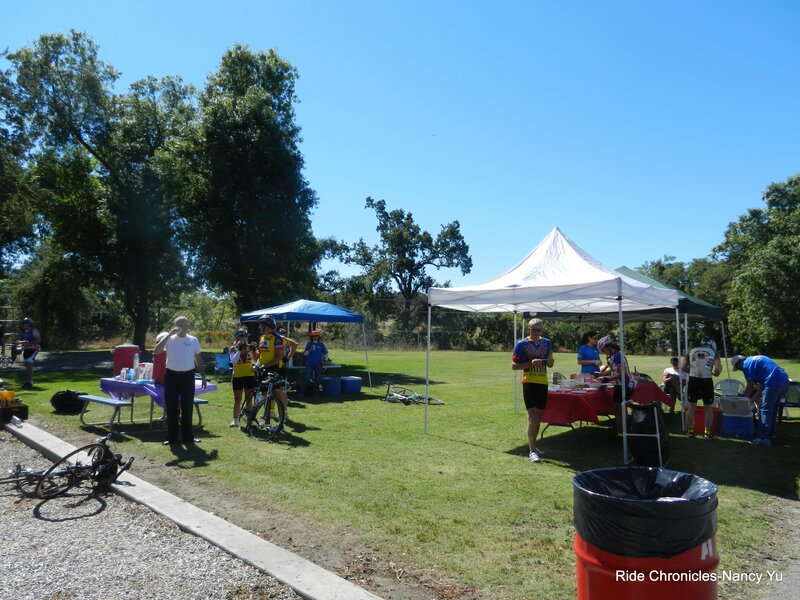 Much thanks to the Fresno Cycling Club and its terrific staff of volunteers who supported us throughout the ride. The route was well marked at every turn and SAG vehicles were seen along the route the whole day & night. 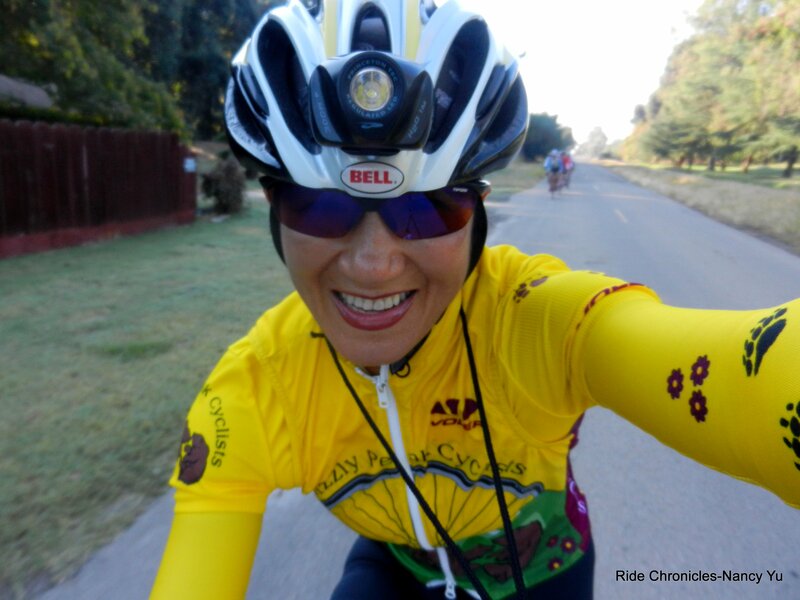 This wonderful double century is definitely at the top of my list; I give it two enthusiastic thumbs up for the great route and especially for all the marvelous supportive volunteers! THANK YOU, THANK YOU! Weather: EXCELLENT! Clear early morning skies turning to brilliant sunshine through the day. Mild winds. Temps ranged from 58F in the early morning & dropping down to 48F near Piedra and reaching a high of 83F on Powerhouse Rd. Finishing temp 60F. Nutrition: Lots of water, maltodextrin mix, PBJ sandwich, a banana, half ham & turkey sandwich with pickle chips, slices of watermelon, canteloup, dried mango, chicken cup o’ noodle, small cup of chicken congee and wonton soup, some corn chips and popcorn, a can of Coke and Mountain Dew. Thanks, Nancy! I had heard some bad things about the cars on this ride but your summary has convinced me to give this one a try this year. Nancy, nice write up and great pictures. 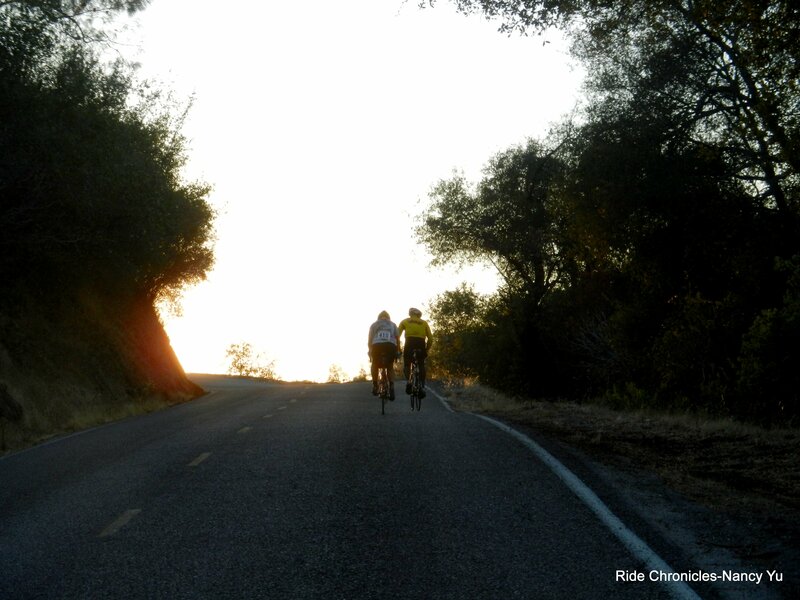 I especially like the one of the cyclists going up the hill into the sunset. I wish I would have done it the year you did. I did it this year (2015) and it was so hot I lost 8 pounds despite drinking 15 large bottles! 106 on Powerhouse, both climbs! Thanks Tim. Congrats on completing the late season Powerhouse DC in such sweltering conditions!